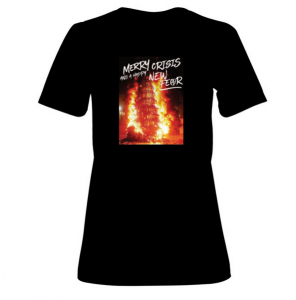 T-Shirt Women (Black) with “Merry Crisis – Happy New Fear”. Look for other colours in our shop. All profits of this product will be used to finance our independent reporting and Info-Café. T-Shirt Women (Black) with “Merry Crisis – Happy New Fear”. Look for colours in our shop. All profits of this product will be used to finance our independent reporting and Info-Café.